Will your event require more than one type of space for what you want to provide for your guests? Do you have large exhibits or big auction items? Maybe you simply desire as much flexibility as possible when it comes to the building and staff for your event. We have good news for you—the Convention Center was made to meet these types of needs. 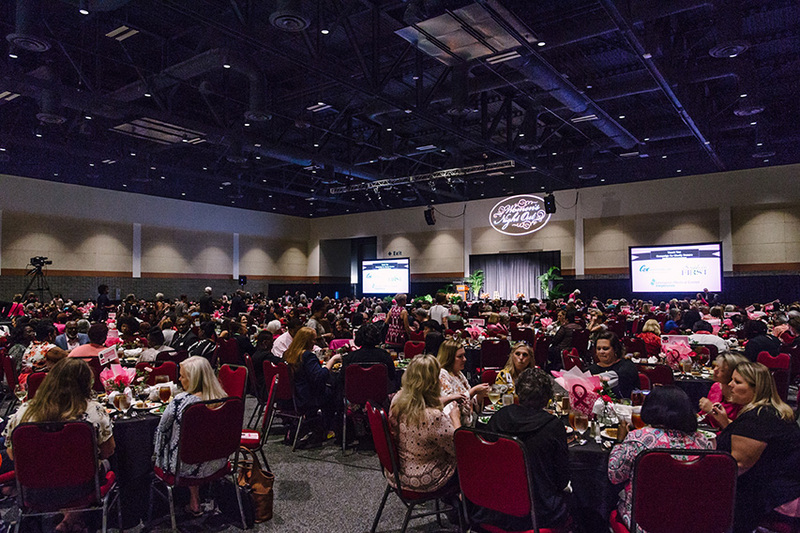 The CMCC pulls off elaborate events all year long, including the Pawmetto Lifeline Fur Ball and the Lexington Medical Center Foundation's (LMCF) Women's Night Out. These clients chose to utilize our many spaces and accommodating staff for events that won't soon be forgotten by their satisfied guests. When you plan an event like Fur Ball that includes a red carpet entrance, silent and live auctions, a swing-calypso 3-piece band, an open bar, heavy hors-d'oeuvres, and a VIP reception, you need a venue that can help you make the night flow with a seamless set-up. Pawmetto Lifeline organizers utilized our Ballroom on the Upper Level for the VIP reception and the Exhibit Hall on the Lower Level for the red carpet entrance and main event. After utilizing the valet service at the entrance upstairs, attendees were able to walk to the VIP reception or ride the escalator to general registration. We can support your larger-than-life needs when it comes to our versatile spaces. For example, both the Fur Ball and Women's Night Out event had silent auctions this year. Some of the big-ticket items included cars, paintings, grills, and a boat. 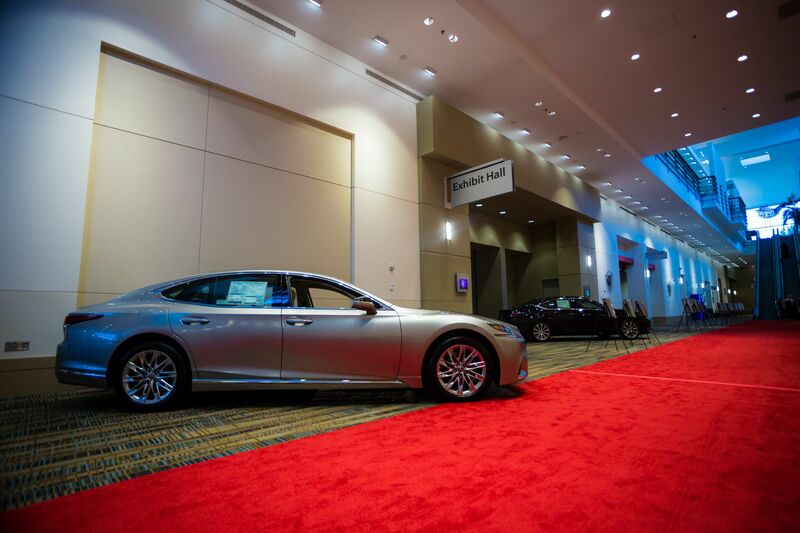 The two organizations made it very clear to the Convention Center that they appreciated how our venue can accommodate driving a boat and four cars in, while still transforming the Exhibit Hall, our largest room, into a highly elegant event space for black-tie affairs. We can provide A/V support and LED screens to help highlight a display or items being auctioned off. Both Pawmetto Lifeline and LMCF expressed how having the extra technology created a more professional and polished feel and increased the participation in auction bidding. When it comes to special requests for a menu that you want to get just right, Chef Tommy is at your service. For the Fur Ball, he worked with a local food partner, Blue Marlin, to craft delicious hors-d'oeuvres. Chef Tommy assisted with kitchen use, prepping, and providing all of the staff that worked at each station. He also met a special request for a nontraditional meat-carving station by preparing a tomahawk ribeye for guests. As for LMCF and their event, our Chef was more than willing to prepare a small percentage of vegetarian and gluten-free options that were available upon request. In addition, the group requested a specialty "Pink Pineapple" drink made by hand with vodka, pineapple, and grenadine. Spectra, our award-winning culinary experts, accommodated that request and served the specialty cocktail at all of the bars. Ready to combine our venue spaces to create your perfect event?